Jo Malone will launch London Blooms, a new collection of scents inspired by English gardens and botanical drawings, in March. The collection comprises three limited edition fragrances, Peony & Moss (shown), White Lilac & Rhubarb and Iris & Lady Moore. Peony & Moss ~ a light fresh floral with peony, blackcurrant, moss and ivy. White Lilac & Rhubarb ~ a delicate floral with notes of rose, rhubarb, lilac and heliotrope. Iris & Lady Moore ~ a fresh spicy floral with geranium, ivy and vetiver. 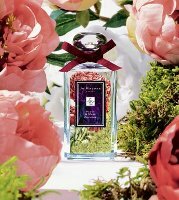 Jo Malone London Blooms Peony & Moss, White Lilac & Rhubarb and Iris & Lady Moore will be £72 each for 100 ml Cologne. I really wish there were smaller size (and price) options for many of these Jo Malone series. I’m still behind on the Tea Blends and Cologne Intense line, and really have a hard time buying 100ml of almost anything these days. Even if they’re only cologne strength, it would take me a long while to use them up. There may be a 30 ml size and I just don’t know about it yet? I think they originally only did the Tea Blends in 30 ml, which makes more sense. They all sound pleasant. However, my ‘fume dollar has to go farther this season and I’m not inclined right now to spend $100+ on such watery fragrances. Not loving JM lately, personally…I thought Wild Bluebell was pretty dull. But will give these a shot. Maybe the iris one will be lively? From the notes, these sound totally up my alley but Jo Malone isn’t one of my favorite lines and I fear these will not live up to my expectations. Excited about the notes and bottles, but yeah, what’s up with 100 ml. I bought three 30 ml bottles from the Tea Collection, no way I will buy three 100 ml bottles. The iris one does sound nice to me, but yeah, 100 ml is a lot of anything! am loving the flowers on the bottle…havent yet bought one jm….i will sniff these tho, just for curiosity. WANT THEM ALL! Love Anything Jo Malone! and what was wrong, BTW, with Wild Bluebell??? I Found it Enchanting…???? Nothing was wrong with it, I just found it dull — and you found it enchanting, and it’s not the first time we disagreed on a fragrance, right?